In the early 1700s, at the dawn of the commercial marketplace, author Eliza Haywood published her first novel, Love In Excess, to great critical and mass acclaim, earning it equal billing with Daniel Defoe's Robinson Caruso as one of the most popular novels of the early eighteenth century. The novel was a somewhat racy exploration of women's private and public lives. Not much biographical information is known about Haywood, other than that she wrote professionally and acted in the theater to support her two children. In the mid-1800s, writer Fanny Fern, a contemporary of (and more financially successful than) Herman Melville, published her semi-autobiographical novel Ruth Hall, which delved into a woman writer's negotiation of the publishing industry and her marriage and family. Ruth Hall was a smash hit with readers (although a bit less so with literary critics, who couldn't understand why a woman would write such a scathing piece on the marketplace and marriage). In the early 1900s, two of the most popular writers of the time, Edna Ferber and Fannie Hurst, explored similar themes -- women's need to balance the marketplace or the workforce with family life. In some cases, women's foray into the workforce was met with treacherous consequences (i.e. loss of husband/relationship to children); in other cases, female protagonists balanced the two brilliantly. Biographically, Ferber never married, nor engaged in any romantic relationships at all, as far as anyone knew, and Hurst raised eyebrows with her separate living arrangement with her husband. What this brief look back through literary history can show us is how women (and men!) have always been concerned with the gender politics of the work force. Hundreds of years ago, these professional women writers were trying to figure out how to balance career and family. This is not to say that today's concerns about these same issues should be dismissed, but rather that the struggle has a long history, one which gives a more nuanced perspective to today's critique of gender and class problems in the workplace and job market. In a recent interview with Guernica Magazine, historian Stephanie Coontz talks about gender inequality and class disparity in the job market from the Depression to the present. One of the most interesting aspects of her discussion, to me, was the situation of women after World War II and how it compares to today's situation. 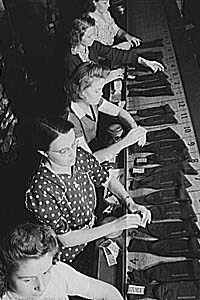 "...as the postwar economy expanded, many government and business leaders began to believe that women workers were needed to fill shortages in the service sectors of the economy. So there was a campaign to get wives to rejoin the labor force after their children had reached a certain age. Of course this was not done for the sake of women’s emancipation, but from the need for a lower-paid, non-union segment of the labor force that could more easily be hired and fired or mobilized as part-time workers. "So there were these contradictory messages for women. You weren’t supposed to compete with men, and you were supposed to stay home when your children were young. But then you were supposed to stop being a “parasite” and go get a part-time or low-paid job that would contribute to the gross national product and our ability to out-produce the Soviet Union. But you shouldn’t get a job that paid enough to threaten your husband’s identity as the primary breadwinner or interested you enough to compete with your total absorption in your role as wife and mother. Advice books in the 1950s and 1960s actually said this! "There are equally contradictory messages today. Now middle-class women are encouraged to enter the rewarding and challenging careers that used to be reserved for men. But once they have children—which is typically just as their careers are hitting their strides—there is still a tremendous sense that becoming a full-time mother is the way to go. So there is all this social approval of career women “opting out.” But low-income women—the ones whose jobs make it much harder to combine motherhood with full-time employment—are now the ones considered parasites if they try to stay home with their kids. Instead they are pressured to find jobs, any jobs, no matter how ill paid or how long the commute and the work hours. Middle-class children are thought to 'deserve' full-time mothers in the home; poor children are not. And at the same time many conservative legislators are pushing to restrict the ability of women, especially low-income women, to control when and if they have children." Coontz's critical comparison shows how men and women's struggle with gender roles has been perpetuated into late capitalism. Moreover, it shows how class stereotypes and political propaganda now serves to reinforce this same struggle that has been experienced throughout the history of the commercial marketplace. Read Coontz's entire interview here. Labels: Consumption Junction, corporate issues, history, literature, politics, poverty, U.S. Thanks for this interesting article. I think what has been a great coup for capitalism is that as women have been "allowed" to take on more important and even powerful roles, men still dominate the landscape of work, home and politics. Men in power remain threatened, not only by women, but by people of different ethnic backgrounds as well, and they certainly have made adjustments and strategized about how to maintain that power. These things are unlikely to change. There are a lot of important points you brought out. Women in the workforce and family aren't topics that are looked into enough when we talk about labour and capitalism. Historically, it's such an important issue to comprehend! Thanks for the link to the interview.